Considering that the season premiere of The Last Kingdom ended with quite the declaration of intent, what with Uhtred dropping a head on the doorstep of Bebbanburg and all, it’s a smart choice to pick up “Episode 2” right where that episode left off. The first episode of The Last Kingdom benefited from a sense of urgency, building up the individual story of Uhtred while also filling in the historical details for added context, and that pace is once again applied here. Having Uhtred and Brida ride their horses into the woods to escape Aelfrick and his men achieves a number of things right off the bat, not only establishing a furious pace to the episode but also setting in motion the series of decisions that the two will face as their loyalties become divided between their Danish family and their Saxon roots. With the characters and context firmly established in the premiere, “Episode 2” narrows its focus a bit, turning its attention to Uhtred and Brida and the difficult spot they’ve been placed in given the murder of Ragnar and much of their adopted family. Initially their thought is to go to Ubba and explain how Sven and Kjarten staged the raid on the Ragnar household. That plan becomes dangerous though when they find out that Uhtred is being blamed for the massacre, his Saxon blood being used against him as reasoning for why he’d slaughter the very family that took him in. Still, the two are out of options, so heading to East Anglia, and English village that Ubba has recently seized, makes the most sense. Still, they need a plan for when they get there and that’s when the show finds some of its best dialogue. The chemistry and interactions between Uhtred and Brida are the highlight “Episode 2.” Their friendship and romance obviously runs deep, but it’s the way the two balance each other out that makes their partnership so rewarding to watch. Uhtred is hotheaded and quick to act, thinking little about the long-term implications of his actions. On the other hand Brida is more collected and rational, thinking through every iteration of their decisions and weighing the costs and benefits of each. Brida is often in charge of reining Uhtred in, but that doesn’t mean she’s a buzzkill. Rather, she’s working towards the same goals as Uhtred and understands much of his motivation and is therefore in a position to shed light on when he’s getting ahead of himself or acting too hastily. Their interactions are more than just an excuse to enjoy some great dialogue though—and yes, “we should hump tonight” totally counts as great dialogue. 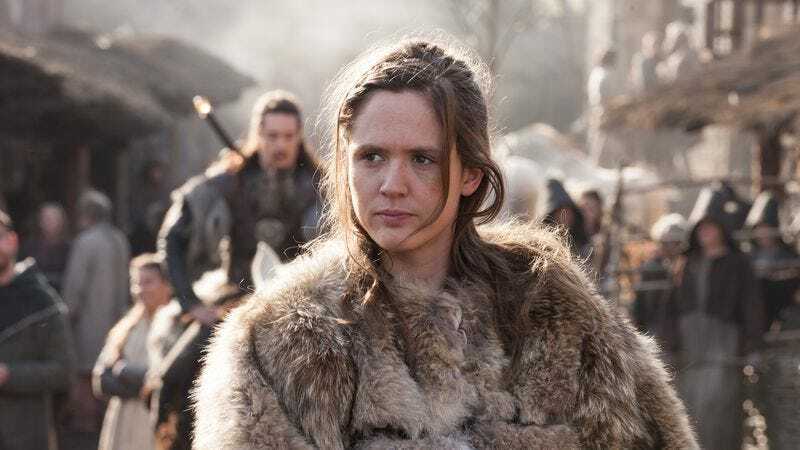 In fact, the continuous banter and more significant conversations they have is representative of The Last Kingdom‘s attention to character in general. There’s a substantial amount of depth to many of these characters even though the series is only two episodes old. Uhtred and Brida are certainly the focus here, but the show has a deep bench in terms of cast and characters. Consider how through only two episodes most of these characters feel fully-realized. There’s Ubba, the eccentric and violent Dane with a propensity for belief in sorcery. There’s Beocca, former priest of Bebbanburg now at home in Wessex alongside Alfred, his loyalty divided between England, God, and Uhtred. Even King Edmund, who doesn’t get a ton of screen time in “Episode 2,” is a character with clear motivations who’s put in a complex situation given the presence of Uhtred and the encroaching Dane army. What all the great dialogue and character work allows for is meaningful, insightful, and engaging storytelling. The plot might be clear and somewhat predictable—it is, after all, written down as history of sorts—but the kind of storytelling on display is what makes The Last Kingdom, and the relatively fast-paced “Episode 2,” so compelling. The captivating storytelling extends to the direction as well, with tonight’s episode boasting more than a few gorgeous and brutal shots, including one of Uhtred killing a rushing Dane through a door. The best of the bunch though sees Uhtred and Brida standing on a hill, the sun rising to their left while East Anglia, courtesy of Ubba, burns to their right. It’s a stunning shot, the two bright embers—the rising sun and the burning village—standing out amongst the more muted dusk of the horizon. And there’s Uhtred and Brida at a distance from it all, not quite a part of Ubba’s crusade because of their Saxon heritage, but also drawn to his cause because of their connection to the deceased Ragnar. Such a shot conveys so much, about this time period, about the Danes, about Uhtred and Brida, adding meaningful depth to the already fleshed-out story. What’s remarkable about “Episode 2” is that it doesn’t bother to sit still after such an expeditious premiere. Now, that does work against the episode to a certain extent, as Uhtred’s move from proposing a plan to spy on the Danes to Alfred, going to spy on them, and then returning to warn them about an impending battle seems rather rushed. Some more contemplation could have served both Alfred and Uhtred better, but that’s a small problem in an episode that otherwise takes all the focused character and thematic work of the first episode and builds upon it in substantial and exciting ways. Considering that “Episode 2” ends with both Uhtred and Brida captive in hanging cages while King Edmund, Alfred, and the rest of the Wessex army confront the advancing Dane army, The Last Kingdom shows no signs of slowing down. One aspect I loved about this episode that I didn’t get into above is the score, provided by John Lunn, who’s won two Emmys for his compositions on Downton Abbey. Where nothing about it stood out in the premiere, tonight’s episode boasted some interesting, sparse electronic elements. It reminded me of Cliff Martinez’s score for The Knick and how the electronic score heightens, or maybe twists, the historical setting. Testing God by putting your faith in him stopping arrows is apparently not a great idea. More great shots: the camera following Uhtred and Brida as they try to escape their assassins. It’s a shot that does a good job of conveying chaos and unpredictability.